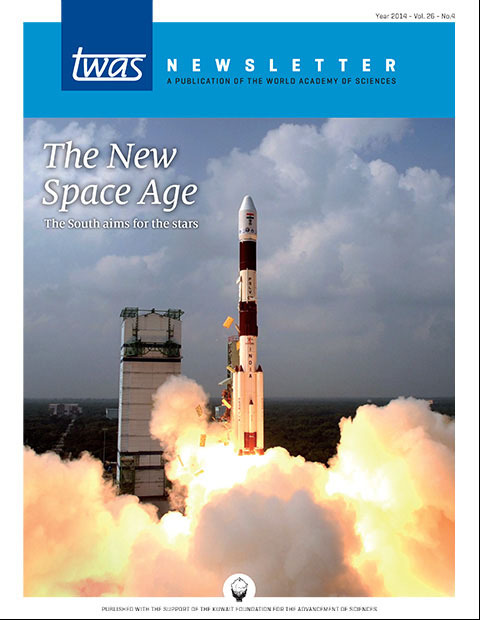 PDF of the entire issue (5.96 Mb). Executive Director Romain Murenzi: It’s essential for development. Cities are facing more heatwaves. Costa Rica makes clean-energy history. India is orbiting Mars. China is on the Moon. Many smaller nations are sending satellites aloft. But to what ends? Can a nation have space science and also fight hunger and disease? The Egyptian TWAS Fellow uses space science to improve life on Earth. TWAS and three other Italy-based science organizations were the focus of a presentation to top Italian government leaders. The office eyes a future as a regional science and engineering leader. Five women physicists, mathematicians win the 2015 Elsevier Awards. The former TWAS president has long supported developing world science. The Caribbean needs the political will to back research and education. The nation’s Academy of Sciences inducted its first elected members. Atta-ur-Rahman: Islamic countries should commit to research. The path to science has been unique for Almas Taj Awan of Pakistan.